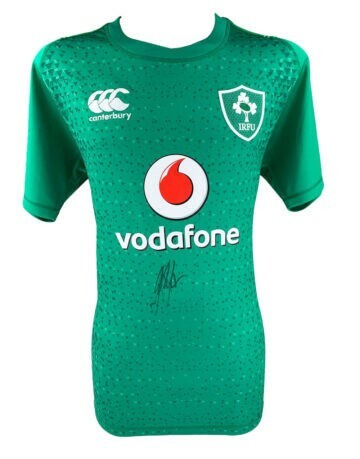 Shop our Ireland Rugby team signed shirts, balls and autographed photo displays featuring individual player signatures and full team autographs! All come with free UK delivery, worldwide shipping and a Certificate of Authenticity, many have photo proof! The Irish have a rich heritage and history when it comes to rugby – with passion for the sport and play stretching back over centuries. It is the third-oldest rugby nation after England and Scotland – but certain ancient texts trace football-style games played in Ireland right back to the 16th and 17th centuries. In the late 1800s rugby as we know it today started to become incredibly popular in Ireland, with Trinity College in Dublin driving much of the early interest and participation in the game. Fast forward a hundred years or so and the passion for rugby in Ireland is as strong as ever. Massive crowds and sell-out stadiums signify this, both on a regional and national level. Ireland’s national team occupy the first tier of World Rugby and consistently excel on the European and world stages, having beaten each one of the world’s rugby giants on numerous occasions with the exception of New Zealand. They compete in the Six Nations competition each year and the Rugby World Cup, which is held every four years. They have also consistently competed in the European Rugby Champions Cup, having won several times over the course of the competition. 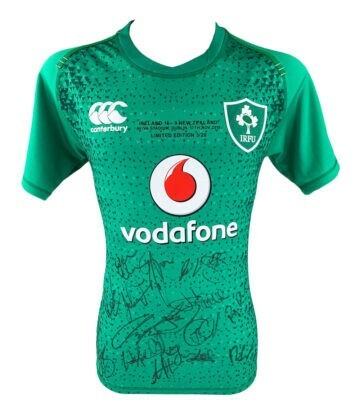 Rugby unifies Ireland – and its professional structure is described as ‘all-Ireland’, with one governing body (the IRFU) presiding over the Republic of Ireland and Northern Ireland. There is also only one national team and league under this body. Traditionally rugby was seen as an Anglophile sport in Ireland played by the middle classes – but this perception is slowly becoming unstuck, with a wider variety of participants entering the sport. 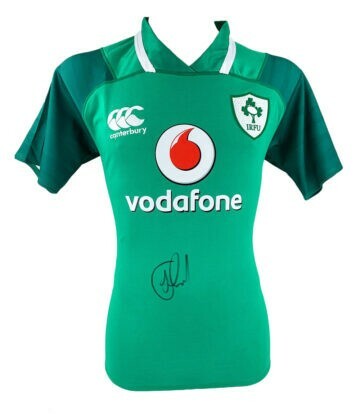 Rugby fans will find plenty of extra-special commemorative items in our collection of signed Irish rugby memorabilia. 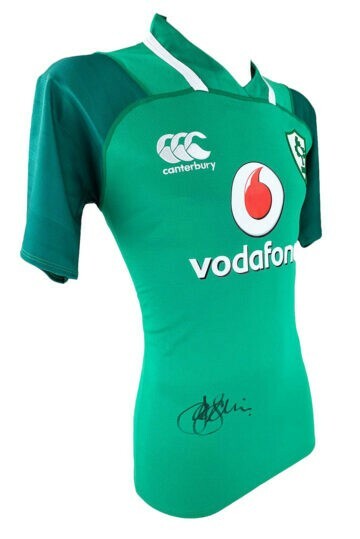 Here at Firma Stella we have 100% genuine signed Ireland rugby shirts, rugby balls, boots and other ephemera. Browse now to find your perfect match.